This is the seventh-generation model, sold from 2013. Which other used hatchbacks are also worth a test drive? It’s a good idea to test drive alternatives to the VW Golf, if only to reassure yourself that the German hatchback is, indeed, a class-leading car. Where you begin depends on your preference. After all, some people view the VW badge as being a cut above the Fords, Kias and Vauxhalls of this world. So Audi’s A3 is an obvious starting point, because it offers a similar range of petrol and diesel engines, a classy cabin and similar levels of space inside. However, compare broadly similar engine and trim levels and the A3 is likely to cost more because it was more expensive when new. Another posh badge on a mass-market car can be found on the BMW 1 Series. Some drivers enjoy the car’s slightly more sporty feel on the road, but others find its interior is on the cramped side. Other premium models to benchmark are the Mercedes A-Class and Volvo V40. If you’d prefer that your budget went toward a younger used car with lower mileage, try the Ford Focus. It lacks the classy cabin and excellent infotainment system of the Golf, but is accomplished to drive and affordable to run. If you find cars about as emotionally appealing as a fridge, then consider the Kia cee’d and Toyota Auris. Those manufacturers offer a seven and five-year warranty from new respectively, unlike VW which offers just three years of cover. Volkswagen’s designers appreciate that a family hatchback like this doesn’t need more party tricks than a children’s entertainer to meet drivers’ needs. So it has a fuss-free dashboard that favours class over colourful design, and the layout is a model of simplicity. The quality of the materials and fittings is first class; only the Audi A3 feels more upmarket than this. And the driving position is excellent, with plenty of adjustment for drivers of all shapes and sizes and seats that proved comfortable after a long day in the saddle. 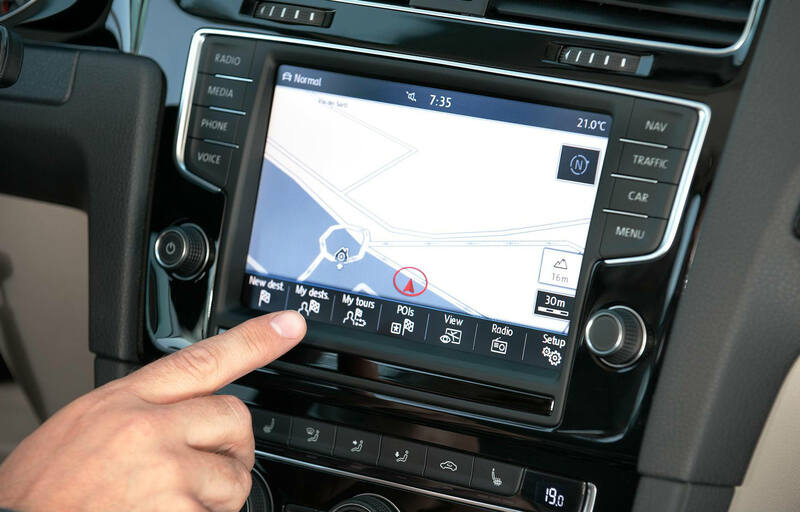 A highlight is Volkswagen’s touchscreen infotainment system. Wisely, it features buttons at the side of the screen that acts as menu shortcuts and is a doddle to operate because of it. And an information display between the rev counter and speedo gives an overview of various settings and driving information. The Golf also offers a generous amount of cabin space. 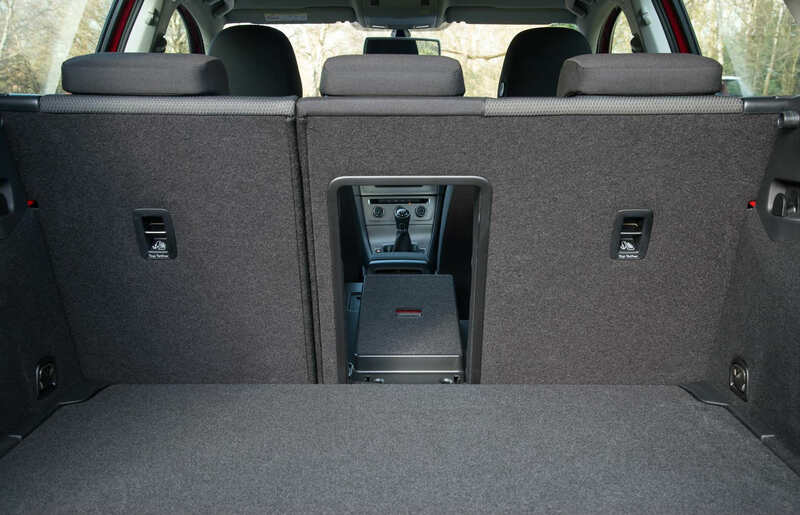 Even in the three-door model, four adults can sit in comfort, while parents will be pleased to find that the five-door version has fairly large back doors that give good access to child seats, and all models come with two sets of Isofix seat mounting points. With 380-litres of luggage capacity, it’s also more than practical enough to handle carrying the clobber of everyday life. Volkswagen threw in plenty of standard equipment with the seventh generation Golf, when it went on sale in January, 2013. The German car maker wanted to shift consumer perception that the Golf was a good car but had fewer creature comforts than a hermit’s home. The entry-level S models featured a 5.8 inch colour touch-screen, DAB digital radio and CD player with an iPod connection, Bluetooth smartphone connection, multifunction computer and manual air conditioning as standard. Remote central locking, electric front windows and an electronic parking brake were also included. Move up to a BlueMotion and alloy wheels were included, while the Match offered parking sensors, electric mirrors, automatic windscreen wipers, adaptive cruise control and an emergency braking system that senses an obstacle ahead of the car. Sporty GT models came with larger alloy wheels, sports suspension, a body kit, sports seats, tinted glass and a navigation system. There are also GTD, GTI and R models, as well as the electrically powered e-Golf. To achieve a maximum 5-star safety rating for its Golf, awarded by Euro NCAP, Volkswagen fitted it with systems that could tension seatbelts, close windows and the sunroof in advance of an impact, or apply the brakes in advance of, or after, an impact. GT models and above came with traffic sign recognition, to help drivers keep an eye on local speed limits, while every Golf came with electronic stability control and all manner of airbags for front and rear seat occupants. There were a couple of desirable options across the range or on certain trim levels. The first was what VW called Lane Assist with Side Scan, which basically helps prevent a car wandering out of lane and checks for vehicles in a driver’s blindspot, an option on every trim level. And S and BlueMotion models could also be ordered with optional adaptive cruise control. 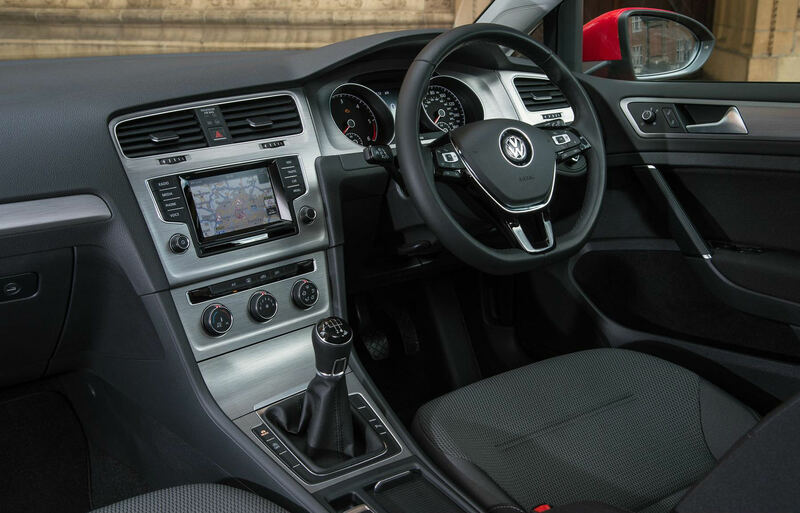 The Golf is a smooth mover, able to cover long journeys with ease and leave the driver and passengers feeling relatively fresh after hours on the road. The secret to this is the impressive level of refinement in the cabin and how well the suspension copes with Britain’s broken road surfaces. Even in the diesel models, noise levels are hushed and the way the Golf steers, rides and handles pretty much sets the benchmark for this type of car – only a Ford Focus offers a little more poise on a winding road. If you’d prefer to drive a petrol-powered Golf, the 1.2-litre TSI engine (105PS) can return up to 57.6mpg. Those after a diesel should browse the used 1.6-litre BlueMotion models, which are able to hit 88.3mpg with a manual gearbox, which is impressive. It’s a close call, but by a whisker, the 1.2-litre petrol Golf is the most affordable on the used market. However, there’s precious little difference between this and the 1.6-litre diesel, so keep your options open and look for the example that gives you the most for your money. 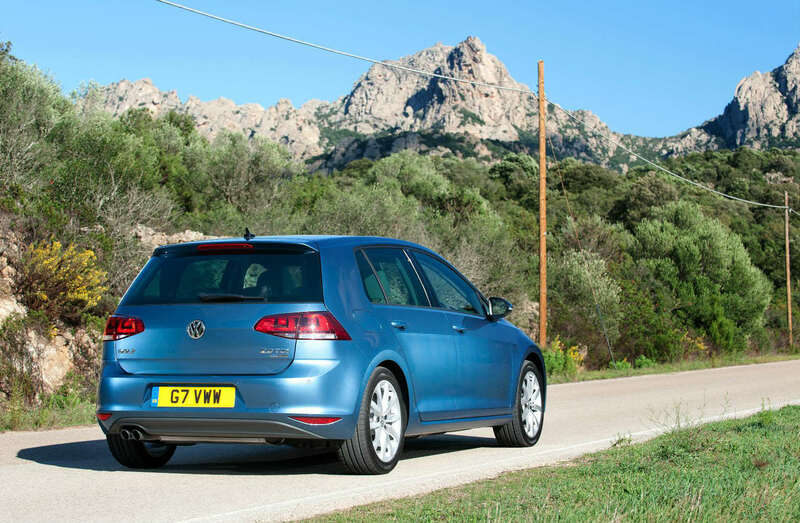 This is where prices start for the earliest examples of the seventh-generation Golf. There are some 1.6-litre diesel models in this price range, too, but the mileage will be higher. For £8000 the mileage of used Golf drops significantly. A three- or four-year old BlueMotion model would be an excellent addition for drivers after a frugal family car. You’ll be able to choose from a wide range of models for £12,000, such as a 2015 2-litre diesel or a 2016 1.4-litre petrol, and all will have low mileage.